Renal cell carcinoma: can we identify patients with advanced disease? Kidney cancer is among the 10 most common cancers in both men and women with approximately 61,560 new cases and 14,080 deaths from this disease expected in 2015. Clear cell renal cell carcinoma (ccRCC) is the most common form of cancer in the kidney, accounting for 75-85% of renal tumors. The steady increase in procedures that image the abdomen has resulted in an ever increasing discovery of small kidney masses that are often difficult to diagnose without a surgical procedure. Although many of these are harmless, some prove to be malignant. The size of a lesion can often be used to determine the stage of a tumor with masses smaller than a golf ball (≤ 4cm) being of relatively low risk. However, some small lesions have already spread to nearby tissues or to distant sites so size cannot be the only determining factor. Fig. 1. Genes previously associated with renal cell carcinoma that can differentiate between high-grade ccRCC, low-grade ccRCC, and non-cancerous kidney tissue. Genes in red are upregulated in ccRCC samples compared with normal and benign samples; blue, downregulated. While the diagnosis of RCC is often established with a surgical procedure to obtain a tissue sample, there have been efforts to investigate molecular biomarkers that would lead to a less invasive blood or urine test for diagnosis and prognosis of kidney cancer. In order to characterize ccRCC, we utilized gene expression microarrays to compare high- and low-grade ccRCC to both normal kidney tissue and tissue from benign kidney disease. A study using microarrays enabled the measurement of more than 20,000 genes in a single experiment. The investigation of a large number of genes in a single study provided an unbiased look at ccRCC without the need for predetermined speculation as to the changes between the tissue types. This enabled the discovery of gene expression biomarkers (Fig. 1) that can differentiate ccRCC from non-cancerous tissue and furthermore differentiate high-and low-grade ccRCC. This included genes such as E-cadherin and lysyl oxide. Expression of E-cadherin is lower in low-grade ccRCC compared to the non-cancerous tissue and is lowest in high-grade ccRCC. The loss of E-cadherin can contribute to cancer by increasing cell growth and metastasis. In contrast, lysyl oxide is overexpressed in both the low-grade and high-grade ccRCC but shows nearly triple the level in high-grade compared with low-grade ccRCC. Lysyl oxide expression has been shown to be important in metastasis and outcome in studies of breast and head and neck cancer. Fig. 2. 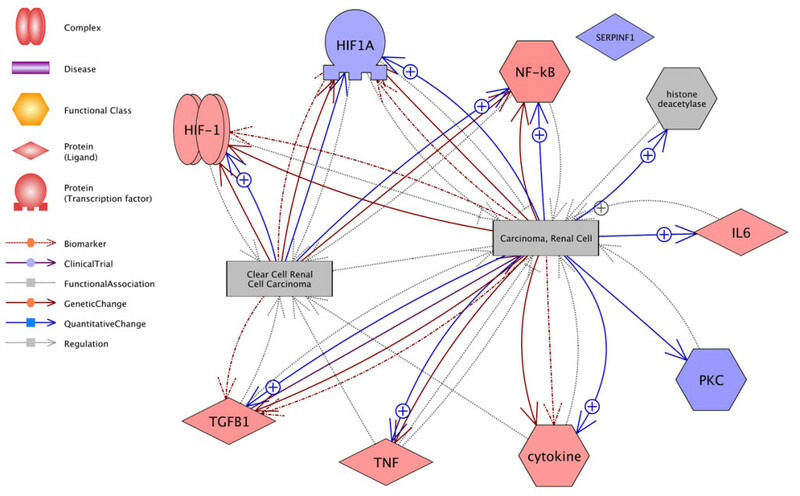 Pathway illustrating the known links between RCC and signaling pathways identified to vary among high-grade ccRCC, low-grade ccRCC, and non-cancerous kidney tissue. In addition to individual targets, larger signaling pathways are also documented as crucial to the progression of ccRCC. 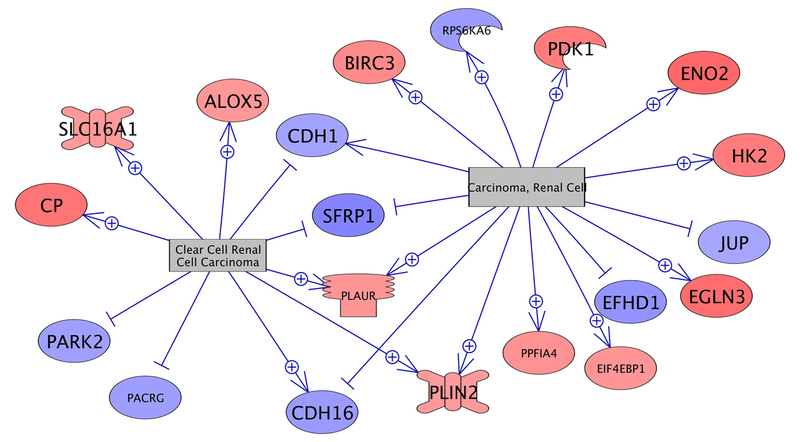 Figure 2 illustrates the link between the larger signaling pathways identified as altered in the study and renal cell carcinoma. This included signaling centered on hypoxia-inducible factor 1α (HIF1α). Its presence is interesting given the controversy in the literature regarding the role of HIF1α in ccRCC. Some studies ascribe HIF1α with a pro-cancerous effect as it is associated with blood vessel growth and cell survival. However, other studies have shown that HIF1α inhibits the growth of RCC. While we saw no change in expression of the individual HIF1α gene, the HIF1α signaling pathway was highly regulated between the high- and low-grade ccRCC. This may prove to be an interesting discovery as most previous studies simply compared RCC with normal kidneys. Here the importance of HIF1α signaling is highlighted by separate comparisons of high and low grade ccRCC to non-malignant kidney tissue. The objective of this study was to determine gene expression markers to differentiate between high- and low-grade ccRCC. Furthermore, these markers should be able to distinguish ccRCC from normal and non-malignant kidney tissue. Although further confirmation in a larger group of patients is required, the current study provided potential biomarkers as well as insight into the biology of ccRCC progression that could aid in a physician’s treatment decisions. Characterization of clear cell renal cell carcinoma by gene expression profiling.